We have been reading One Snowy Night. It is snowing in the park and all the animals knock on Percy’s door. They want to come in out of the cold. Percy offers them a warm place to stay. 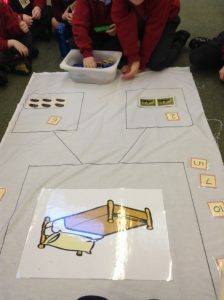 We have been adding the animals to find out how many are sleeping in Percy’s bed. 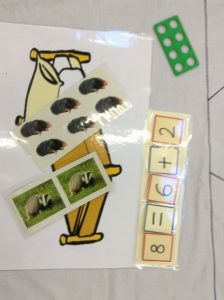 There are 2 badger and 6 moles, these are the two parts. The animals all got into Percy’s bed. How many are there altogether? We have been having a go at creating some number sentences to show addition.